The Credit Card Transaction Entries page displays any transactions processed with NAV-X Credit Card. It also displays status information about the individual transaction entry, such as if an entry was voided or if it was declined. The transaction entries page can be accessed from several different places, for instance, from the sales or service documents or from the credit card page. Authorize – When a credit card is authorized, a transaction is created showing the authorized amount. Capture – After a card is charged, a transaction entry with “Capture” is created. The original authorization will then have the “Transaction Status” set to “Captured”. Refund – A new transaction is created when a previously captured transaction is refunded. Sale – If the processing mode is set to “Sale”, a transaction is processed with a type “Sale”. This indicates that the a card was not authorized and charged, but only a sale was processed. Void – When an authorization is voided, a new transaction with the type “Void” is created. Credit – When a credit memo is refunded to a credit card and the original invoice was not paid by credit card, a refund can still be processed against a credit card, if the bank allows this. This is sometimes also referred to as an “open credit”. The credit card number that was used for this transaction. The card number is only shown “masked”, which means that only the last four digits of a credit card are displayed. The type of the credit card used for the transaction. When the transaction was processed, the result can either be “Success” or “Failure”. Failure indicates an issue with the transaction processing. You can find the actual error message in the field “Error Message” or by clicking on the action “Show Error”. 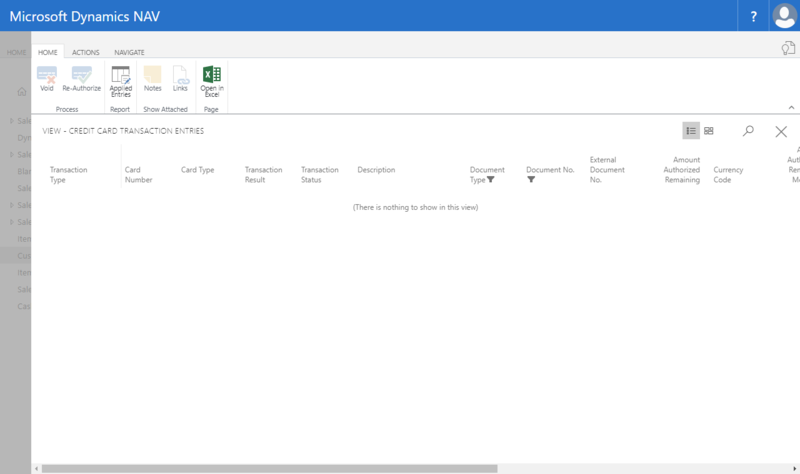 The default transaction status is blank or empty indicating that the transaction was processed. It can have any of the additional values as shown in the list. Voided – When an authorization was cancelled by the user, the status is set to “voided”. Expired – If an authorization was not captured in time, it expires. This status indicates that the transaction expired and the funds have been released. Captured – Once a charge has been processed against a previous authorization, the authorization is marked with the status “Captured”. Refunded – If a refund was processed against a previous charge, the status of this transaction is set to “Refunded”. Pending – A transaction is set to pending when it was not processed by the gateway yet. The description of the transaction. Displays the document that is associated with this transaction entry. The external document number from the original document. When a transaction was authorized, the amount of the authorization are stored in this field. It is updated as a transaction is captured against it. The first amount is the amount in the transaction currency and the second field displays the amount processed in the merchant account’s currency. The currency the transaction was processed in. When a transaction is captured, the captured amount is displayed in this field. When refunds are processed against the transaction, the amount captured is reduced. The first amount is the amount in the transaction currency and the second field displays the amount processed in the merchant account’s currency.